The recently concluded 2018 Sharjah Light Festival bathed the emirate’s Khalid Lagoon with multicoloured lights, illuminating its waterfront attractions and architecture in a multidimensional spectrum. The Khalid Lagoon and Palm Oasis were host to spectacular displays. Cambodian artist Cindy Lo designed a light show titled ‘A House in the Sea Under the Moonshine’ at Masjid Al Noor. Lo created cosmic geometric shapes and colours with charming lights spreading in harmonious movement on the facade of the mosque. They formed abstract paintings, pictorial art and a mixture of images that interact with the structures and details of the beautiful building. The show embodied the creativity of Lo, who is known for paintings that evoke reality and connections between the infinitesimal and the infinite. The artist is also recognised for specialisations focusing on the links between the ancestral image of the universe and contemporary cosmology. The Light Carousel show at Khalid Lagoon in Sharjah featured the work of artist Nicholas Gautier, who wielded his highly technical skills and experience in lighting. Gautier utilizes advanced technology to produce a stunning, dynamic show using powerful searchlights. The show, aptly named the ‘Sky Tracer,’ started with powerful searchlights scanning the surrounding skies and waters of the lagoon, while spinning lights sent out an intense myriad of colours in all directions at high speeds –like a carousel freewheeling over the lagoon, lighting up the sky in a multidimensional spectrum. Visitors to the Palm Oasis, which is located next to Masjid Al Noor, enjoyed a spectacular installation, titled ‘A-Mazein.’ The captivating structure, designed as an immersive experience by Nomada Design Team, represented a fantastic maze of lights. 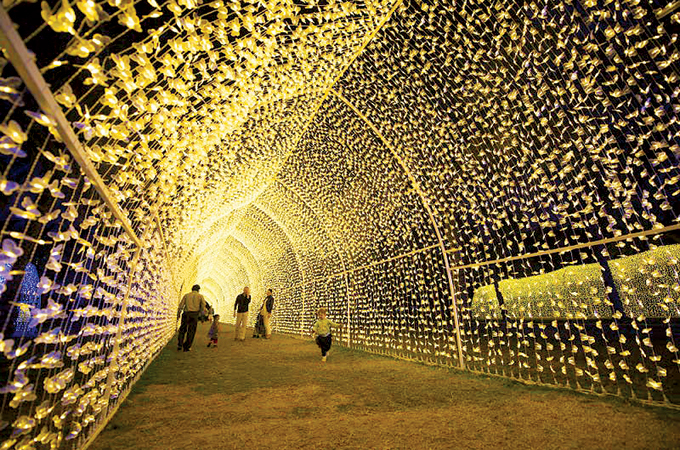 Visitors could enter through one of the 14 openings and immerse themselves in tunnels of light. Sharjah Tourism will once again be promoting its attractions along with hotel partners at ITB Berlin.